At least 40 million Americans have some magnitude of student loan debt to bear. The average amount per person hovers around $26,000. Our nation’s student loan debt has climbed to over $1 trillion dollars and continues to increase. Additionally, at least 10 percent of debtors are defaulting on these loans. These numbers are staggering. Adults, especially millennials, are delaying life events, such as purchasing a home, having a family, and saving for retirement because they are drowning in student (among other) loans. Furthermore, around 30% of college grads are not even working in fields directly related to their degrees. This brings me to the question: what’s the point? In-state college costs currently average $24,000 per year. This doesn’t even begin to touch the cost of attending out-of-state or private schools. If you are planning to further your education, these are all serious matters to contemplate. What if there were a way to earn your Bachelor’s degree for a fraction of these costs and NOT begin your adult life in a posture of debt? Would you like the opportunity to be an adult with No College Debt? I had this opportunity and am here to tell you about it today. My Bachelor’s degree cost less than $8,000 and took just one year of my life. That’s the amount of money the average student spends on one year’s tuition, and three years of life I got to spend doing things like earning money which I didn’t have to then send off to debt collectors every month. I can show you, too, how to earn a degree for under $10,000 in as little as one year. I’m not going to tell you, you must be a genius or have some special super power that the other 99% of the population doesn’t possess. What I am going to educate you on is for “the average Joe”. Do you follow through with plans and goals? Are you comfortable with self-study and taking multiple-choice exams? Do you seek a degree in Liberal Arts, Communications, Psychology, Business Admin, Computer Science, Accounting, or Social Sciences (this is not an exhaustive list)? Then you may be the perfect candidate for an Accelerated Degree relying largely on self-study and examinations in place of attending traditional college classes. This method of learning requires significantly less time and money to achieve, but is a 100% legitimate degree! You study at home for any given college subject, perhaps biology. When you feel you have mastered the subject, you go take the exam and, upon passing, receive college credit as if you had attended the college class. I studied TWO WEEKS for my biology exam and earned 6 college credits — that is a two semester class nailed in two weeks for under $100. Repeat this process for as many subjects as possible, work with an accredited college that is accepting of non-traditional education, and you will have a degree before you know it. Admittedly, you can’t take an exam for every credit. But there are several methods for earning those credits as opposed to simply “clocking in” to a traditional class. Are you interested in earning a degree in this way? Maybe you would like to attend traditional college, but want to utilize examinations for some of your credits? Let’s sit down and have a nice chat in my living room, shall we? In this light-hearted, conversational style eBook, I will explain every detail of how you can earn your degree by taking examinations, attending online or local classes, as well as, organizing portfolios for life experience. Taking these non-conventional measures of education is how you can earn your degree debt free and in a short amount of time. I want to help YOU! When reading this information, I hope you feel right at home and like we are good friends. I had such a wonderful experience earning my degree, I just want to tell everyone all about it! Learning should be fun and energizing! 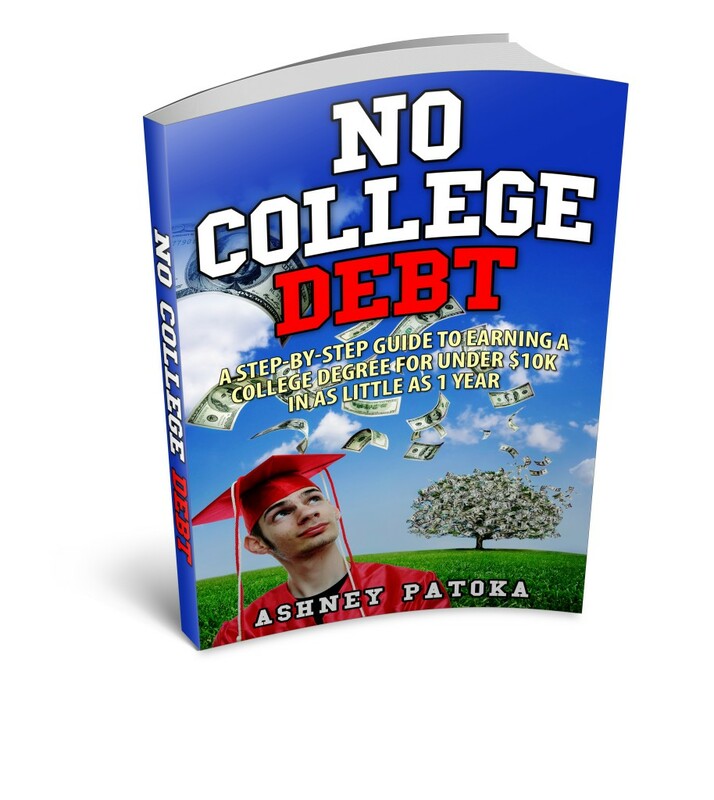 Everything you need to know about earning a college degree is in my eBook! I discuss with you schools that are friendly to these alternative educational avenues. Any school I recommend is always regionally accredited (the highest form of accreditation) so you can be confident in the quality of your diploma. The massive amount of our nation’s student debt keeps colleges in business. Why would they tell you there is an alternate way? True, not everyone can benefit from earning credit in non-traditional ways. We do need university settings for certain degree types, but wouldn’t you at least like to know your options? Let me help you explore your college options in my user-friendly eBook and/or consulting service. The information you will gain in this material cost me $2,000. I knew nothing of an accelerated degree using CLEP exams and similar credit earning methods. So I paid $2,000 for a service to take me every step of the way. It was a great program and I still fared much better than most college students, but I would have liked the option to save that money and “navigate the waters” on my own. The help of an informative eBook would have suited me perfectly. Join the ranks of informed students today. 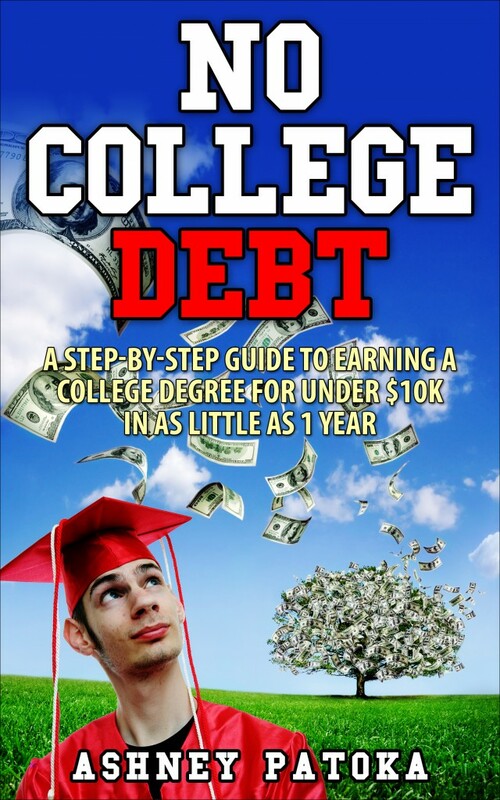 By purchasing No College Debt, you will become equipped to start directing your education and avoid being a statistic in the $1 trillion dollar student debt crisis. To the first 1,000 ambitious students, we are offering No College Debt at an unbelievably low price of $27. This is less than the cost of one college textbook. For this $27, you will gain the knowledge needed to earn your entire degree for dimes compared to your peers. Remember, $27 gets you what cost me $2,000. Why would I offer this information for so low? Because I want as many people as possible to know how to earn a degree on the accelerated path without incurring large amounts of debt. One thing my husband has taught me to be passionate about is being debt free. It is quite liberating. And it truly saddens me to think of all my fellow 20-something year olds in America buried in mountains of debt and delaying the precious things in life (like family!) just because they didn’t know they had options. If a traditional degree and incurring student loans are what you need to do in life, then go for it. I am in no way putting down the folks who need to attend university for years and spend thousands upon thousands. We need doctors, engineers, etc. But if you are, at the very least, curious about this unique alternative way, then why not make this small investment on your education? It may just save you tens of thousands of dollars. By purchasing No College Debt, I am confident you will become fully able to earn your degree by your own leading. I have gone to great lengths to ensure the information in this material is clear, direct, and easy for anyone to follow. However, if you read this material and within 30 days, are not satisfied with the information, I will gladly provide you with a full refund. I am confident you will be so blown away by what you learn, you wouldn’t dream of requesting a refund, but the offer still stands nonetheless. So what if you purchase the eBook and decide to start earning your degree on an accelerated path, but would like a little more direction on exactly what examinations/courses you need to fulfill your degree goals? No problem. I am here to help with that as well. For a fee of $100, I am happy to give you a degree guide to meet your educational needs. First, you will fill out a questionnaire so I can know about your goals and degree direction. I will then provide you with suggestions for what exams and classes would fulfill your degree ambitions. Lastly, we would have a brief phone discussion about your personalized guide and discuss anything further to get you started down the college path! Earning a college degree in an un-conventional way can seem a bit overwhelming to some. Since I have successfully walked the road already, let me assist you in getting your plan together quickly! These consulting sessions are provided on a limited basis. They are personally handled with care by my team (aka my husband and I) so be cool and grab your spot today. Nobody wants to be on a three year long waiting list for such a helpful service. Please note, if you are on a tight time schedule and need the degree consulting very quickly, contact us before purchasing to verify the wait time. Please visit this page for more information about Degree Consulting. Are you ready to earn your degree debt free? This material is so much more than just an eBook! Our 100-page material is a training manual that will save you tens of thousands of dollars. $27 is a small investment for such a huge savings! Be one of the first to get our user-friendly, practical guide. Why not start learning and earning today? Having walked this road already, you can let me do all the hard work for you! In No College Debt, you will become informed and equipped to take charge of your education rather than student loans taking charge of you for decades to come. Don’t be a statistic. Go against the grain so you don’t have to delay your life any longer!